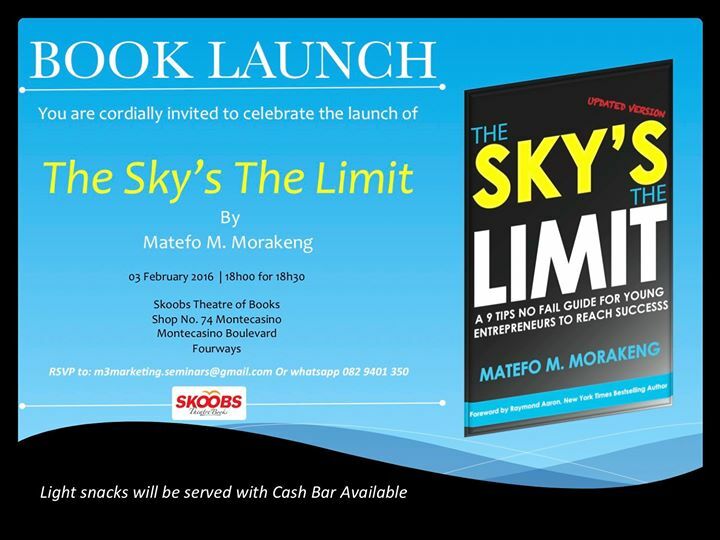 BOOK The Sky's the Limit. South Africa keeps on producing intelligent, dynamic, successful black women now increasingly turning out their own books. These books tend to touch on many things - fiction, biography/autobiography, and poetry. Mashile, JahRose Jafta, and other younger SA black female authors. "A no-fail guide for young entrepreneurs to reach success. The author here guides you to achieve success in your journey as an entrepreneur. The steps she outlines are critical that might not be taught in a university or College. Once you understand them and apply them in your journey, you will soon realise that entrepreneurship or running a business is doable with the right mindset and reasonable expectations. Passions, emotions, relationships, networks, change and mentorship are all explored in this book,"